This step appears twice in the Event Wizard, but behaves similarly in both cases. For some events, like Districts, there are no awards on the first day (in which case the first Award Assignments step is simply not used). [Red] In order for an award to be visible on the web through the FIRST website, it must be marked as "Post" using the checkbox in that award's row. [Black] Using the Set Field to Awards Mode button the lights and team signs can be changed in the arena to a more universal look that's ready for the awards ceremony. [Blue] Control buttons used to manage the award presentation process. Described below. After all awards for the day (or the event) have been presented, use the Upload Award Assignments button to send those assignments (if marked with Post) to the FIRST website. (Red, right photo) Type the team number of the winning team, and the team name will appear below as the team number is typed. If the award is presented to a team that's not competing (such as at District Championships) the number will show a red triangle "error" indicator, meaning the team did not compete at the event. (Blue, right photo) After a team and/or person has been entered, the Save button commits this change. Cancel ignores the edits, Clear removes the award winner. (3, left photo) The Display Award Name to Audience button displays a "frame" on the Audience Display informing them which award is being presented. (4, left photo) ONLY AFTER THE EMCEE HAS ANNOUNCED THE WINNING TEAM NUMBER The Reveal Winner to Audience button displays the winning team's number and name to the Audience. See Audience Screen for examples of what these screens look like. 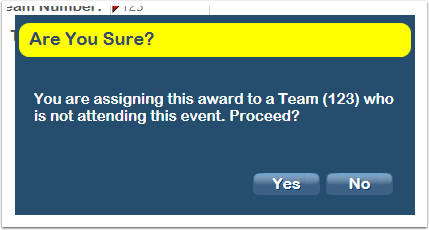 When a team number is entered on the Assign Award dialogue, there are potential confirmation messages that can be presented. Awards can be assigned to any registered FRC Team in a given season, even if that team is not present at the event. This situation applies only to District Championship and FIRST Championship events, where a team does not always have to be competing at the event to win the award. If an attempt is made to assign an award to a team not competing, confirmation is required. Upon each award assignment, the assignment is compared against an eligibility algorithm for the given team to determine if they qualify for that award. 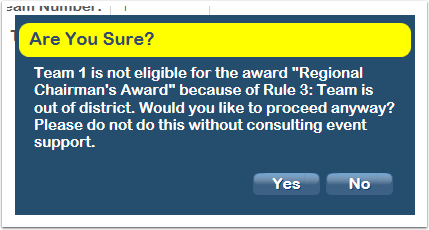 If an attempt is made to assign an award to an ineligible team, a message is presented and requires confirmation. Consult with the Judge Advisor for additional information. If more than one instance of an award is being presented, but not enough instance are showing in the available awards list, a duplicate can be made. For example, if two Judges' Awards are presented, click on the Judges' Award and press the Duplicate Award button on the bottom of the screen. A second instance (with "Series" 2) will be created and available for assignment. 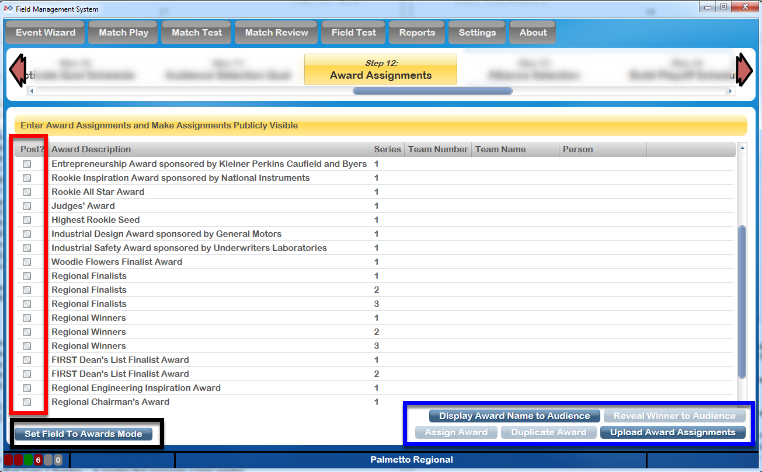 FMS Off-Season does not support award distribution, and as such all buttons will be “grayed out” on the two award assignment wizard steps.